Keep your Mom healthy and fit with the UA Health Box! It has everything she needs to keep on track with her fitness goals including a UA Band, UA Scale, UA Heart Rate Chest Strap and the UA Record. The water-resistant UA Band measures her sleep, resting heart rate and daily activity daily activity. The UA Scale tracks her progress, body weight and fat percentage. The water-resistant UA Heart Rate Strap keeps track of her heart rate, heart rate zone, and workout intensity. Lastly the UA Record is her body's dashboard and it collects her data and provides a 24/7 view of her progress. She can set goals, capture sleep, log workouts, measure activity, track nutrition, and connect with friends! This is the perfect gift for the Mom that loves fitness and wants to stay healthy! Who doesn't love a MASSAGE? With the HoMedics® Air Compression + Shiatsu Foot Massager your Mom can have a foot massage everyday! The massager delivers a deep kneading shiatsu massage that relaxes overworked soles and arches. With its variable air compression massage, the foot massager gently pushes down on your foot to deliver a deeper, more intense massage and comfort to tired feet. This is the perfect gift for a Mom that is always on the go and needs a little break! Mom is an endless source of love and understanding. Show her how much you love and appreciate her with Mariposa's "Mommy & Me" Photo Frame. The frame is handcrafted from 100% recycled Sandcast aluminum and is the perfect frame to add a photograph of a memory with her! Give your Mom a piece of Alice in Wonderland with Disney's Alice Through the Looking Glass Desk Clock! The clock was inspired by the live action film "Alice Through the Looking Glass". The circular metal frame desk clock features The White Rabbit in a hurried state and is the perfect reminder for Mom to keep from being late for very important dates! 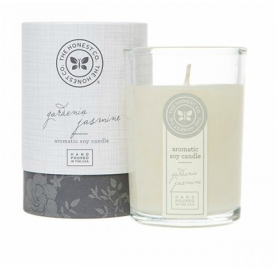 Indulge your Mom with the delightful scent of a Gardenia Jasmine Soy Candle by Honest. Its non-toxic, aromatic fragrance comes from pure essential oils and extracts that offer hours of long-lasting delight! 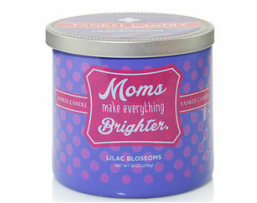 Keep your Mom happy with the scent of Lilac Blossoms! The Yankee Candle "Moms make everything Brighter" has a gorgeous scent in a beautiful mid-height candle. The candle is made with 2 wicks to double the fragrance love and includes 40-50 hours of burn time. Empower your Mom with a blend of Yang Energy Scents which include mandarin citrus, and basil. The fragrances behind Carole Shashona Empower Mist are meant to be used together to dispel negative energy & create positivity and abundance. The mist provides a rejuvenating and cleansing sensation that creates positivity and abundance once the space has been purified and "neutralized." Your Mom will feel refreshed and empowered and will be happy you bought this gift! If your Mom loves keeping her Home smelling fresh, the ​Greenleaf Flower Diffuser in Classic Linen is a perfect gift! It is a fresh fragrance of air and clean water, wrapped with sweet floral and balsamic notes! The diffuser smells as beautiful as it looks and adds a nice accent to any home decor. Food equals memories, whether it’s your Mom's famous Apple Pie or your Grandmother's chicken dish. Each taste and smell draws us back to our childhood. Why not capture those memories with the Keepsake Kitchen Diary ™, it's a functional, beautiful holder for your families special memories. Each page provides ample space to record dates, recipes and thoughts in a meaningful way. The Keepsake Kitchen Diary ™ is a one-of-a-kind heirloom and DIY cookbook that will bring joy to your Mom and for others in your family for generations to come! Surprise your Mom with a SWEET assortment of decadent bonbons inspired by Breakfast! The 5-piece ​Breakfast in Bed Bonbon Collection by chuao includes flavors like Mocha which is a rich coffee buttercream inside a coffee bean shaped dark chocolate bonbon and Orange-A-Go-Go which is a bonbon made of caramelized orange peel, orange liqueur and dark chocolate ganache. 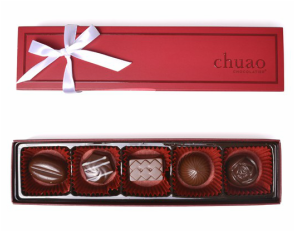 chuao chocolates are handcrafted with ethically sourced cacao, gluten free ingredients and are free of artificial preservatives, sweeteners, colors and flavors. 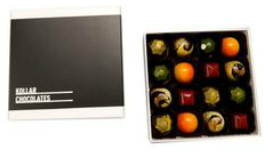 Any Mom with a SWEET TOOTH would love a truffle assortment from Kollar Chocolates! They are one of the Top Ten Chocolatiers in North America! Their truffles range from traditional flavors like Milk Chocolate and Raspberry to unique flavors like Fennel Pollen and Sunflower Seed Praline. You are sure to find a selection that would suit any palette! Give your Mom a gift that POPS with Pop Art Snacks Popcorn! The Popcorn is made of organic ingredients and comes in six uniquely infused flavor combinations. Some of our favorite flavors include Rosemary with Italian Truffles, White Pepper with Parmesan Cheese and Thai Coconut Curry. 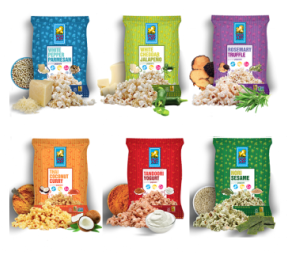 The popcorn flavors appeal to the slightly eccentric foodie and health conscious snack-lover and makes the perfect gift for any Mom that enjoys a delicious and unique snack! Surprise your Mom with a SWEET treat with Pepperidge Farm! Since 1937 Pepperidge Farm has been a brand that has been providing the best in baked goods from their famous Goldfish crackers to their Milano's. Delight your Mom with the coveted new Milano® cookie flavors: Mocha Chocolate and Salted Caramel Chocolate. They are available for a limited time and make the perfect gift for Mother's Day! Delicious and oven baked, these moist, ready-to-eat Bauli Mini Croissants are the perfect Mother's Day sweet treat! The naturally leavened Bauli Mini Croissants are soft and available in two filling flavors: Chocolate Cream, and Vanilla Custard. Baked in a REAL oven to ensure superior taste and quality, the croissants will help make the day a touch sweeter! A gift from Zak Designs would make any Mom happy! 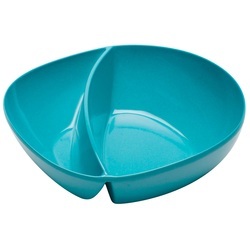 Their biodegradable Moso divided bowls are the perfect gift for any Mom that likes to cook and serve in beautiful dishes. The bowls are made with 75% bamboo, which is a natural material with the sleek look of plastic. They are highly durable and are perfect to serve two types of food in one dish such as chips and salsa or even sushi with soy sauce! Surprise your Mom with a stylish set of Outdoor Oasis Melamine Salad Plates! Your Mom will serve up classy cuisine on these colorful plates. The plates come in a set of four and have six different designs to choose from. They are made of durable melamine, are 9 inches in diameter and dishwasher safe. They are perfect for use for indoor or outdoor entertaining! Your Mom will love Disney's colorful Alice Through the Looking Glass Ceramic Plate Set. The plates are perfectly sized for cucumber sandwiches and petit fours! The plate set is inspired by the live action film "Alice Through the Looking Glass" and will make her tea party guests "mad" with envy! This is the perfect gift for a Mom who loves Alice in Wonderland! ​If your Mom loves having company and cares about her serving-ware, she will love Mariposa's Pearled Handle Cheese Tray. Mariposa partnered with Vermont craftsman, J. K. Adams to create this unique serving tray. The tray is made from North American Ash and Aluminum. The Pearled Serving Board features the signature "String of Pearls" handles and is a beautiful gift your Mom will love! If your Mom loves to cook, she will love to cook with Bialetti! The Sapphire Line contains cookware that are made of quality materials that allow for superior heat distribution and they are all dishwasher safe for easy cleaning. The cookware is made with metal utenil safe Nanotec™ infused non-stick coating for a lifetime of use. The cookware is safe for gas, electric, glass and induction stovetops. Let your Mom know that she has been the Super Woman in your life with the Wonder Woman Sculpted Coffee Mug! This mug is hand-painted and made of ceramic and it holds heat well to keep her drinks warm. She can use it everyday to add a little fun to her morning routine, or put it on a shelf to show off. This makes a very unique gift that any Mom would love! Does your Mom love wine? If she does, she will LOVE ​the Avex Insulated Claret Wine Glass! It will keep her wine chilled for up to 4 hours. It also features a no-sweat design, contoured shape, and thin rim for sipping comfort. Your Mom will be saying cheers to you for such a great gift! Give your Mom the gift of MAGIC with the Magical Butter 2e! Magical Butter makes Herbal Butters, Oils, Tinctures, Soups, Sauces, Salad Dressings, Skin Care Products, Pet Medicines, and much more! She will be using your gift all year long! Make your Mom's life easier with the Hoover 2-in-1 Handheld and Stick Vacuum. Weighing only seven pounds this light vacuum packs a punch with its Windtunnel 2 Technology which means that it uses two channels of suction to lift and remove deep down embedded dirt! The vacuum doubles as a upright vacuum and a hand vacuum which is very versatile! With the touch of a button the vacuum adapts to your floor type and can easily clean couches, stairs and hard to reach places. Since its so lightweight Mom can bring the vacuum anywhere she needs to around the house! Give your mom the gift of CLEANLINESS with the Black & Decker 36V Lithium Stick Vacuum with Ora Technology. The vacuum is truly a lifesaver when it comes to cleaning. The vacuum includes a 12 Air-Cyclone to help prevent clogging for true no loss of suction. It also includes lithium technology for strong suction and fade-free power, a detachable hand vac for cleaning versatility and a powered brush for easy carpet cleaning. The vacuum is also self standing when not in use for convenient storage. Your Mom with love the ease of use, the power and the function of this versatile vacuum cleaner! Give your Mom a comfortable rest that is personalized just for her with a bedgear Performance Pillow. Input your Mom's sleep habits, body size. mattress type and preferred temperature into the Pillow ID software to find out which pillow is perfect to help your Mom get the best rest! ​Surprise your Mom with cool comfort with bedgear's Dri-Tec Performance Sheets! The fabric wicks away heat and moisture while the Air-X mesh sidewalls and hems provide the perfect air flow for better, deeper sleep. 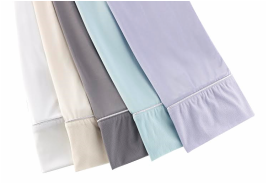 The high performance soft sheets come in six beautiful colors that will match any bed set and will give your Mom the restful sleep she deserves! Protect Mom from household allergens with the AllerEase Hot Water Washable Comforter! The innovative construction of the comforter allows for the ease of hot water washing to destroy bacteria and harmful germs. The tightly woven fabric prevents the collection of dust mites, pet hair, pollen and other household allergens to provide maximum allergy protection. The comforter is also filled with hypoallergenic fiber for year round comfort and is available in three sizes. Your Mom will feel safe, secure and comfortable with this great gift! Keep your Mom looking beautiful with the IMPROVEMENTS LED Cordless 1X/10X Vanity Mirror. The mirror will help her look her best! The dual-sided 7" lighted vanity mirror rotates from standard viewing to 10x magnification. It is ideal for tweezing or for applying make-up. The LED Lighted Vanity Mirror features a satin nickel finish and circular LED light with on/off switch on the base and is lighted on both sides. The cordless mirror requires 4 AA batteries. This is definitely a gift that your Mom will use everyday! Moms love organization, you can surprise her with the ultimate in bathroom sink organization with a beautiful ToiletTree Bamboo Soap Dispenser and Organizer. The organizer includes a soap dispenser, toothbrush holder and two drawers for small items. The set is made of bamboo and ceramic, it makes the perfect addition to any bathroom! ​Surprise your Mom with the key to healthy teeth with ToiletTree's newest dental product; the Rechargeable Sonic Toothbrush. This sleek looking toothbrush provides 31,000 pulses per minute for the ultimate in brushing power. This means less trips to the dentist and very clean teeth! The included cradle gives Mom a place to not only store, but also charge her toothbrush. This is definitely one gift your Mom will be excited to use! For the Mom that loves gardening, the MadGrip Pro Palm Garden Gloves are the perfect gift to keep Mom's hands protected. The gloves feature seamless cushioning to prevents blisters, shock-absorbing palms and fingertip protection. Your Mom will love gardening with these gloves and will love you for this thoughtful gift! 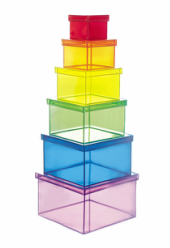 Help your Mom organize with a colorful set of Lookers Square Boxes! This cute set of boxes can store odds and ends in style! From jewelry to make-up these boxes are perfect to help Mom organize! The transparent vinyl packages come in a set of six and make a cute Mother's Day Gift! Warm your Mom's heart with a keepsake jar of 31 thoughtful messages for her to open. It's a unique and perfect way to remind her daily how much you love and appreciate her, not only on Mother's Day, but every day thereafter. This complete gift includes the glass jar, filling, ribbon, KindNotes charm, and 31 messages. Each note is individually enclosed in specialty linen cardstock mini envelopes. The set comes delivered fully assembled and ready for Mom to love! 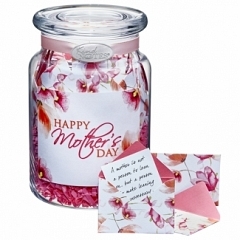 You can choose from message categories to fill the jar or add personalized messages for your Mom. This is definitely a heartfelt gift perfect for every Mom! Viniq Glow is a perfect gift to enjoy with your Mom this Mother's Day! A unique gift in itself, Viniq is a jaw dropper for anyone who hasn’t had the chance to experience its shimmer and fruity taste! It is made with a delicious combination of Premium Vodka, Moscato, juicy peach, golden apricot and notes of radiant blossoms with its one-of-a-kind shimmer. Viniq is a fabulous way to sweeten up Mother's Day! Cooking your Mom a special meal for Mother's Day is easy with the Italian Dinner for Mom Gourmet Gift Basket. This 11-piece curated collection of culinary treats is the perfect gift to send your Mom for Mother's Day. The basket comes complete with everything from an array of appetizers, award-winning artisan pasta, delicious pesto sauce, and delicate imported Italian dessert biscuits that Mom will completely love. These authentic gourmet foods are artfully arranged by hand inside of a gorgeous rustic basket, creating an exquisite gift that's as pleasing to Mom's eye as it will be to her palate! If your Mom is a wine connoisseur, she will love the Mother's Day Wine Gourmet Gift Basket! Inside this gorgeous basket, Mom will find two bottles of coveted wines along with an array of delectable accompaniments. This 8-piece curated collection comes complete with crisp deli-style crackers, smooth Wisconsin cheese, and delicious wine wafers. This stunning arrangement is sure to make Mother's Day unforgettable for your Mom.